The Nursery Kitchen are a supplier of home cooked food for babies and toddlers, using fresh local ingredients. We were approached by Katy from The Nursery Kitchen in 2016, to help improve the brands presence online, their website at the time was ok but was not easy to update, nor was it easy for customers to use. We have now provided The Nursery Kitchen with a brand new, responsive website and a full management system, which is easy to update. We have also created and a nice simple user journey for customers. 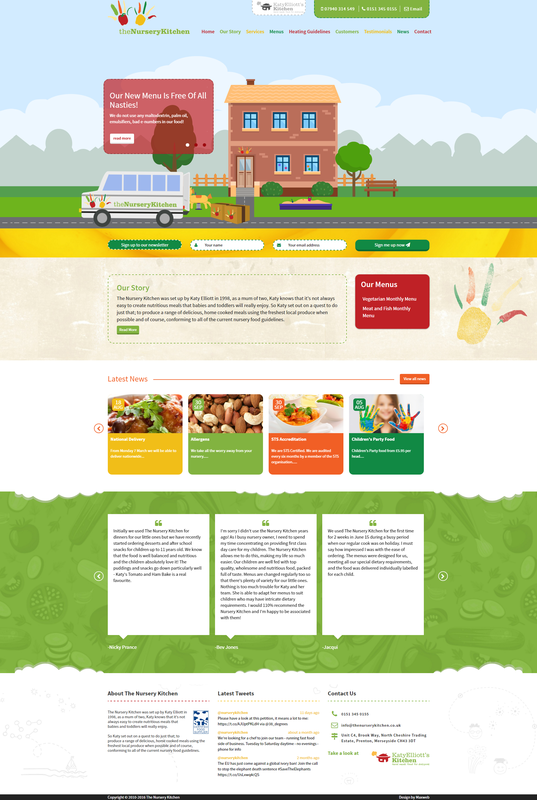 Katy asked for the website to stand out from the normal run of the mill websites so we also included some animation (using HTML 5 and CSS), take a look at www.thenurserykitchen.co.uk to see our delivery animation in the banner. Following this we have also created some product packaging for Katy and gone on to create a new website for her other company Katy Elliotts Kitchen, we continue to work with Katy and thoroughly enjoy doing so. Maxweb played a key role in helping The Nursery Kitchen, increase their online presence by creating a new, fun website, creating product packaging and completing SEO to help generate more leads.